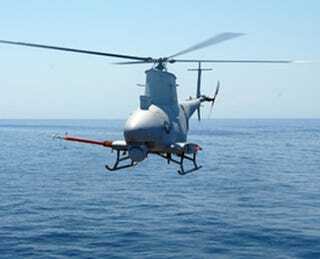 The US Navy's unmanned "Fire Scout" helicopter was out minding its own business on a trial run, when its home base warship detected a suspicious speedboat on radar. That's when Robocopter kicked into high pursuit—filming the whole way. The subsequent three-hour chase finally ended when the speedboat rendezvoused with a fishing boat, at which time a U.S. Coastguard Law Enforcement Detachment unit from the USS McInerney swarmed. What they found: 60 kilos of cocaine, with another 200 kilos of narcotics presumed jettisoned. Oh, and all sorts of bad guy drug traffickers.